Detailed Itinerary of 08 days Cambodia Tour is as appended below. Arrive in Siem Reap, the gateway to Angkor, and a city filled with both vibrant life and quiet pockets of cultural charm. The city boasts modern luxuries but maintains a connection to the tradition, especially with its vibrant night market that fills Psar Chaa with the aromas of fresh noodles and simmering onions. Your private transfer meets you at the airport and takes you to your hotel. A tuk tuk arrives at the hotel to guide you through the exceptional expanse of the Angkor complex, beginning with the iconic symbol of Cambodia, Angkor Wat. En route you notice the vibrant forest trees and can make out the outline of the Siem Reap River floating by. When you come to the entrance at the west gate you feel both excitement and intimidation. The stone brick bridge carries you over the vast moat. Lions stand guard on either side of the pathway. Their mouths are open in a rocky snarl and their eyes are wide. On the other side of the gate you come to a grassy plaza. The temple is reflected in a large pond. Lilies float on the water’s surface. The 12th century temple was constructed with five towers to represent the five peaks of Mount Meru, home to the gods in Hindu mythology. The late afternoon sun continues to drift across the sky. The scent of sandalwood incense emanates from the temple interior. Enter the magnificent edifice and find the elegant reliefs that tell the ancient stories of Hinduism. Above the central gallery you can see the tower that rises 213 feet from floor to tip. The cavernous halls connect each gateway to the main shrine. You find a silent niche in the grand space of the temple. The sunset brings a depth of saffron and ochre to the sky. The light shines over the reliefs and you see an endless row of Apsaras, the female spirit of clouds and water. You wake up to the morning air and know that yesterday was not a dream, but a dream come true. The beauty, elegance, and scale of Angkor Wat were captivating, and it was only the beginning. 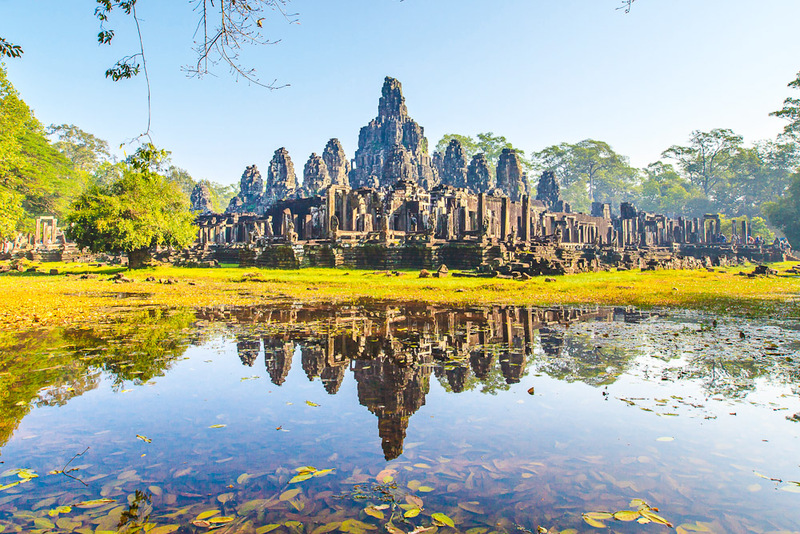 After breakfast your private guide takes you to the capital of the of the Khmer Empire, Angkor Thom. The South Gate is famous for the four giant Bayon faces that decorate the towers, each standing 75 feet tall. Fifty-four towers continue to rise over the ancient complex and symbolize the 54 provinces of the empire. The city was built in a near-perfect square and surrounded by a moat 328 feet wide. The Terrace of the Elephants contains large elephant carvings. The stone trunks act like pillars and stand firm in the ground, supporting the artistic representation of the treasured animal. You can also see detailed reliefs of garuda, a mythical bird-man hybrid. The terrace continues to look out over the open plaza where royalty once stood. Throughout the day you can see monks in bright orange robes sitting near the terrace and studying the various elephant reliefs. The stones are warm and rich with legend. In the morning you will venture to Preah Khan to visit the “Grand Circuit,” a collection of religious and educational structures. Preah Khan is a 12th century temple that was once the center for 10,000 officials and servants. The beauty of the temple is not just within its history but in how nature has imposed itself upon that history. The outer wall was constructed using laterite and the rich minerals lend to the coloration of the edifice in the sunlight. Seventy-two garudas are placed at intervals of over 150 feet. Vegetation is spread along the outer walls and the inner complex. The stone is awash with moss and grass. A two-story building stands above the railed walkway. Buddha images decorate niches above the numerous apsaras. You notice the colonnade and the remarkable tree that grows on its roof. The roots are thick and strong. They spread from the stone rooftop down to the ground and have planted themselves firmly. The canopy brings shade to the plaza and an unparalleled view of nature’s stunning power. Lunch brings you to Sala Bai. The local school trains disadvantaged children in the skills of hospitality. These skills help provide a future in the tourism industry based around the Angkor complex. The children are gracious and gregarious. You can see their enthusiasm for the various aspects of the service industry, from cooking to customer interfacing. The day seems to pass too quickly as you experience the historic wonder and contemporary splendor of Cambodia. Morning washes over Siem Reap and you find the familiar aroma of fresh pressed coffee and pastries drifting from various food carts. Remnants of the French Colonial era continue to peek through the layers of culture and history. The scent of fried noodles and fresh cooked fish emanates from the Old Market. After breakfast you will step aboard your boat to Battambang. En route you will come to Tonle Sap Lake, the largest freshwater lake in Southeast Asia. The rural countryside is lush. The lake’s banks are equally verdant and fertile. You notice houses towering over the water on stilts and situated in the middle of the lake. These fishing villages are known for their ability to traverse the undulating of water throughout the seasons and for their spectacular fishing skills. In the rainy season the water can rise up to five times its normal amount. When you arrive in Battambang you will be enjoy a circus performance from the Phare Ponleu Seplak. The non-profit organization offers projects that provide local youth a way to excel through artistic expression. The children display uncanny ability, not just in their movement, but in the way they combine their modern lives with the historic culture. From traditional apsara dances to acrobatics, you can see the talent and joy in every participant as they display their skills to locals and visitors alike. Battambang is the second largest city in Cambodia and maintains its charm and elegance along its wide avenues and French architecture. The facades almost glisten against the sunlight that reflects off of the river. Cafes are filled with locals and visitors sipping rich coffee and watching fishermen cast their nets into the water. The streets bustle with life but the city maintains the friendliness of a small-town. Just south of Psar Nath is the Governor’s Residence. The French influence is unmistakable in the architecture and the gardens are freshly manicured. A large balcony extends from the upper gallery and wooden shutters decorate the windows. The building was constructed in the early 1900s. It is a wonderful depiction of an opulent period of contemporary history where you can see the surrounding influence of the city’s historic center. A large swath of art galleries and modern restaurants can be found at St 2 ½. The area provides a space for local artists to display their work. Cambodia is a world apart and today you will journey away from the French Colonial charm of Battambang and experience the countryside like a local. The jungle is lush and encompassing. The scent of recent rainfall emanates from the earthen floor. The Bamboo Train is a unique and classic railway journey that travels the antique tracks set by the French. A seven-foot long wooden frame is covered with slats of ultra light bamboo. Other carts are piled with bags of rice, motorbikes, and even monks, needing to make their way farther along the railway, deeper into the countryside. In your train car is only you and your guide, gliding alongside the lush trees. Morning washes over the capital city and you can see the fishermen wading through the Mekong. They cast their nets in the early light and look like silhouettes against the backdrop of calm riverbanks. The longtail boats sway in the gentle current. After breakfast your guide meets you at the hotel. The Royal Palace complex covers 573,720 square feet and the oldest building dates back to the 19th century. Walls divide the complex into four main areas. The throne hall was constructed in the classic Khmer style with gilded, layered roofs. The raised platform is adorned with pillars that support the upper pediments. The elegance of the structure recalls a time when the king was revered as both divine and opulent. The central spire stands 193 feet tall and is topped with a four-faced head of Brahman. The city’s past is the seat of power for one of the most turbulent times in Cambodian history. The Khmer Rouge’s mark is still present across the countryside, however, no more so than at the S-21 Museum. The school turned security prison once held as many as 20,000 people during the height of the ruling power in the 1970s. The solid stone structure wraps around an interior courtyard. The manicured grass and tall, vibrant trees feel out of place. The museum recalls the tragic history that befell the prisoners, along with how it affected Phnom Penh, and the country. Building B is where you will find the photo galleries documenting the different people that walked through the prison gates. The current culture of Cambodia has been shaped by a series of events and continues to grow. From a dim past, many have created a bright future. Phnom Penh is a bustling metropolis that comes to life in the morning light. Beyond the fishermen you can see the bustling avenues that move past the remnants of a French past. The city pulses with energy. You find the aroma of fresh pressed coffee irresistible. You can see people riding their bikes along the cobblestone walkway that runs alongside the river. After breakfast your private transfer escorts you to the airport. Cambodia has offered a touch of the unique, from the culture to the history, and you savored its wonderful difference.